Readability Level: Grades 2 through 4. Each of the three high interest/low readability books in this set includes 88 intriguing short stories, 88 extended writing activities, and over 400 comprehension activities. The stories have been arranged in order of difficulty. Reading passages range from a second grade readability level to a fourth grade readability level. Skills emphasized include locating answers, finding main ideas, detecting sequences, vocabulary and word analysis, finding facts, making inferences, and more. 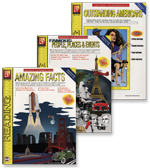 Titles included are Amazing Facts, Famous People, Places & Events, and Outstanding Americans..